Flaaffy in game: 615 Who? Important notice! Pokemon Flaaffy is a fictional character of humans. Flaaffy (Japanese: モココ Mokoko) is an Electric-type Pokémon introduced in Generation II. It evolves from Mareep starting at level 15 and evolves into Ampharos starting at level 30. 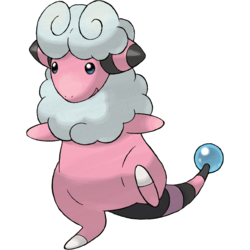 Flaaffy is a pink, bipedal, sheep-like Pokémon. It has thick, conical ears with black stripes on the sides of its head and small, blue eyes. A white mane of wool covers its head and upper body. This mane forms sideways curls on the top of its head. It has stubby arms and one nail on each foot. Flaaffy's long tail has black stripes and is tipped with a blue orb. Storing too much electricity caused Flaaffy to lose the wool over most of its body, but the bare, rubbery skin protects it from the electricity stored in its fleece. The quality of Flaaffy's fleece can change to generate more electricity with less wool. The orb will light up when Flaaffy's mane is fully charged, and it can attack by firing electrified hairs at opponents. Flaaffy typically inhabits grassy meadows and fields. In Spell of the Unown: Entei, one of the Pokémon Molly Hale composed in her dream world was a Flaaffy. A Flaaffy belonging to Sullivan appeared in Whiscash and Ash. This Flaaffy's name is Hannah. A Flaaffy also appeared Under the ownership of Mariah in A Chip Off the Old Brock, as the love interest of Brock's Marshtomp. 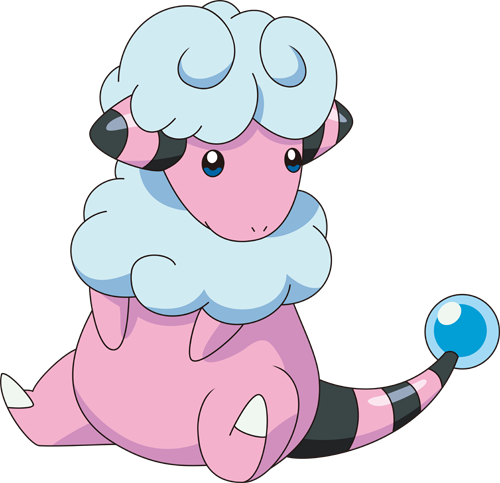 Several Flaaffy were among the Electric-type Pokémon lured by the "Miracle Crystal" that Attila and Hun were using in The Legend of Thunder!. A Flaaffy appeared in All Things Bright and Beautifly!. A Flaaffy appeared in the opening of the third Advanced Generation series Pokémon movie, Lucario and the Mystery of Mew. A Flaaffy appeared in Beating the Bustle and Hustle!. A Coordinator's Flaaffy appeared in Dressed for Jess Success! competing in the Lilypad Town Pokémon Contest. Another appeared under the ownership of Ogin in the movie Giratina and the Sky Warrior. A Flaaffy appeared in Kalos, Where Dreams and Adventures Begin!. A Flaaffy appeared in a fantasy in Clemont's Got a Secret!. A Flaffy appeared in A Campus Reunion!. Three Flaaffy appeared in Pikachu and the Pokémon Music Squad. A Flaaffy appeared in Party Dancecapades!, under the ownership of a Pokémon Performer participating in a dance party. AG075 Flaaffy May's Pokédex Flaaffy, the Wool Pokémon. Flaaffy builds up electricity in its thick coat of fur, but is unaffected by it thanks to its rubber-like skin. In A Flaaffy Kerfuffle, a Flaaffy is seen with a Dunsparce stranded on Bill's boat, it is later captured by Crystal. 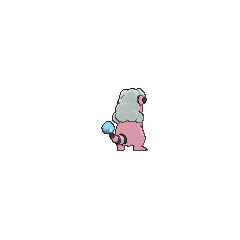 A Flaaffy appeared in The Last Battle XIII as one of the Pokémon sent to help the fight in Ilex Forest. 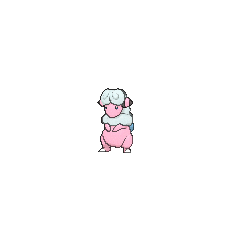 A Flaaffy appeared in Skirting Around Surskit I as a rental Pokémon that Guile Hideout stole. 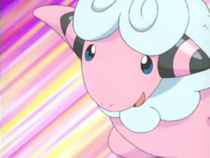 In The Final Battle V, during the Trick Master's story of the homeland soil, a Flaaffy appeared in the flashback when it was one of the Pokémon calmed down by it. One Flaaffy figure has been released. As a result of storing too much electricity, it developed patches where even downy wool won't grow. Its fluffy fleece easily stores electricity. Its rubbery hide keeps it from being electrocuted. Because of its rubbery, electricity-resistant skin, it can store lots of electricity in its fur. Its fleece quality changes to generate strong static electricity with a small amount of wool. The bare, slick parts of its hide are shielded against electricity. Not even downy wool will grow on its rubbery, nonconductive patches of skin that prevent electrical shock. Flaffy's wool quality changes so that it can generate a high amount of static electricity with a small amount of wool. The bare and slick parts of its hide are shielded against electricity. Moves marked with a superscript game abbreviation can only be bred onto Flaaffy in that game. 51%-100% HP My body doesn't conduct electricity! 26%-50% HP Listen, my HP's been cut to half. Level up Yahoo! I leveled up! I'm happy for me! 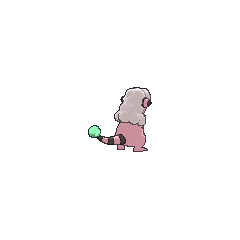 For other sprites and images, please see Flaaffy images on the Bulbagarden Archives. Flaaffy is based on a sheep with patchy wool. Its type and Ability come from how wool builds up static charges. Its evolutionary family may also have been based on the title of the science fiction novel Do Androids Dream of Electric Sheep?. Flaaffy may be a combination of fluffy and baa (the sound sheep make). Aa may also be a reference to an AA battery, given Flaaffy's Electric type. Mokoko may derive from 羊毛 yōmō (wool) and a corruption of もこもこ mokomoko (fluffy). Japanese モココ Mokoko From 羊毛 yōmō (wool) and a shortening of もこもこ mokomoko (fluffy). Korean 보송송 Bosongsong From 보송보송 bosongbosong. Mandarin Chinese 綿綿 / 绵绵 Miánmián From 綿 mián and 綿羊 mián​yáng.